From hiking and biking to canoeing and swimming, there are many ways to get your exercise outside. Research suggests that even low impact activity in the outdoors stimulates endorphins and contributes to both mental and physical health. 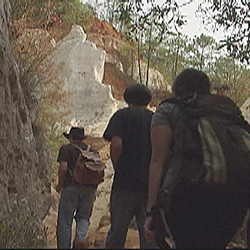 Across Georgia, there are thousands of acres of land open for you to explore. Georgia’s state parks, national forests, wildlife refuges, lakes, and other public lands are great places for wildife viewing, hiking, hunting, fishing, and general outdoor enjoyment. In this episode we'll experience The Tri-the-Parks Triathalon Series, the Georgia State Parks' Canyon Climbers Challenge and attend Unicoi's State Park's annual Outdoor Activity Day looking for other unique outdoors adventures. With 63 State Parks & Historic Sites, Georgia gives you plenty of options for outdoors adventure. And you won't have to travel far. Your biggest challenge - deciding what to. As part of America's national forest system, the Chattahoochee and Oconee National Forests represent the finest outdoor recreation opporutnities and natural resources Georgia has to offer. These lands are rich in history and culture you'll find fascinating to explore. From camping to boating, fishing to resorts, the nine Great Lakes of Georgia beckon visitors from around the world to enjoy these water wonders. The Tri the Parks Triathlon and Duathlon Race Series is the only multi-sport event series in Georgia. Five triathlons, four duathlons, and one aquathlon comprise the series for 2008. One of the events is an all female event. We’ll see you at the start line! For years, marathon runners have endured long distances in their quest for bragging rights and prestigious t-shirts. Now, state park hikers have their own conquest that ends with an exclusive “I did it!” t-shirt. Georgia’s new Canyon Climbers Club is reserved for those few who have scaled to the top of Amicalola Falls, explored the depths of Providence Canyon, braved the swinging bridge in Tallulah Gorge and faced the daunting staircase in Cloudland Canyon. Visit the 11 state parks in the Muddy Spokes Club and ride the designated bicycle trail at each one for a total of 68 miles. Some of the trails are fairly easy, some are moderate and some are strenuous and will give you a challenge. Be sure you are in good health, wear safety gear and take plenty of water along.